The more earth-shattering an idea, the more simply it can usually be stated. But it often takes someone special to see what, afterwards, appears to be crystal-clear. So it was with the concept of grouping a hospital's sickest patients in one place and concentrating nursing resources there. But that obvious idea eluded everyone until 1955. Before then, acute and nonacute patients would be sprinkled randomly through a hospital's wards. Then Dartmouth surgeon William Mosenthal, M.D., established the first intensive-care unit in the nation. 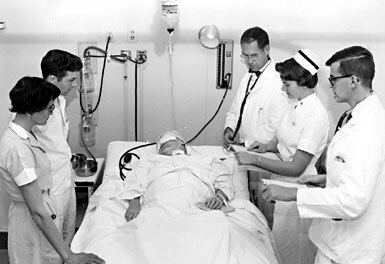 The late Bill Mosenthal is pictured here (at the head of the bed on the right) in the Mary Hitchcock intensive care unitthe first in the nation. "Special unit saves lives, nurses, money" was the title of a journal article that he wrote about the concept for Modern Hospital. The new unit not only improved care for very sick patients, but also reduced disturbances for the less ill. "It was an idea whose time had come," Mosenthal was quoted as saying in a 1991 Dartmouth Medicine article. The system won widespread acclaim and very quickly became the standard procedure in American hospitals. Mosenthalwho died on November 26, 2003, at age 87was a 1938 graduate of Dartmouth College and joined the surgical staff at Mary Hitchcock in 1948, fresh out of residency at New York's Roosevelt Hospital. The concept of the ICU may have been his most far-reaching contribution to medicine at Dartmouth, but it was far from his only one. When he retired from practicing surgery in 1982, he became a full-time, much-loved teacher of anatomy to first-year medical students. He won the graduating class's Basic Science Teaching Award three times. A benefit golf tournament run by students was named in his honor in 1985. A Dartmouth surgical society founded by students in 1995 also bears his name. He fully retired from teaching only a few months before his death. "He adored his students," recalled his son, Richard Mosenthal, at his father's memorial service, and shared with them "not only the science of medicine but also the ethical and moral aspects as well. "One year," went on his son, "he told me, 'There's no good, simple neuroanatomy text for first-year students, so I think I'll write one, with a dissection guide. So he did503 pages, typed in his study with two fingers on a manual Royal typewriter. He was overjoyed when he got a postcard from a first-year student at UCLA Med School who said, 'You don't know me . . . but your text helped me get through neuroanatomy, so thank you.'" "Mose," as he was widely known, was also an avid golfer. A lover of the language. A singer and French horn-player. A keen gardener. He taught anatomy at the local community college and took evening classes there himselfin disciplines as diverse as woodworking, beekeeping, and small-engine repair. "He always experimented to improve things," his son said in his eulogy, "whether it be procedures at the hospital, or training of nurses, or his gardenthis year, his last, it was a warm bed for the melons, soaking peas, watering experiments for the tomatoes. He wanted to make complex things simple." Indeed he did. D.C.G.